Who Wins When Medical Malpractice Claims Are Filed? The Doctors Company (TDC) and their Foundation (TDCF) have been committed to medical education for many years. They have been the major supporter of our annual Telluride Patient Safety Summer Camps for medical and nursing students the past four years, providing full scholarships to sixty medical and nursing students last year so they could attend this week-long immersion in safety, quality and transparency. I have been honored the past two years to be invited to attend TDC Annual Advisory Board Retreat. The retreats have become a favorite meeting of mine, as well as one of the best educational meetings I have attended. One of the presentations I enjoy hearing most is given by Dr. Richard Anderson, the CEO of TDC, who opens the meeting with an update and discussion on the current medical malpractice environment. Dr. Anderson shares claims data along with insightful narrative so that a “novice” to the medical malpractice industry like I am can understand and appreciate the challenges healthcare really faces today. They also appreciated decreases in monthly costs associated with total liability, patient compensation, and non–compensation-related legal costs. Through an open, honest, timely and effective communication approach to unanticipated outcomes, they were able to successfully start addressing the excessive costs Dr. Anderson referred to associated with liability claims. Maybe there is a better approach to the “deny and defend” model we have seen used through the years. One additional figure Dr. Anderson shared also hit me hard this year. The number of claims filed asking for compensation above $10,000,000 has tripled over the last year, with the total claim pool going from $400,000,000 to $1,200,000,000 in total costs in just twelve months. Even gas prices haven’t risen that fast. Has the severity of patient harm suddenly tripled over the past year or are there other factors contributing to this sudden escalation? If interested, The Doctor’s Company website contains numerous healthcare, patient safety and risk reduction resources. Click here for more information. Aye maties! Give me your life! As folks celebrated Talk Like a Pirate Day on 9/19/13, days earlier the CDC posted their own skull and cross-bones. The pirates here are resistant bacteria causing people to lose their lives at a rate of 23,000 a year in the US. How did we become captured by these pirate bacteria? A picture is truly worth a thousand words. We are getting to a point in time that has been predicted. And its scarier than any pirate! 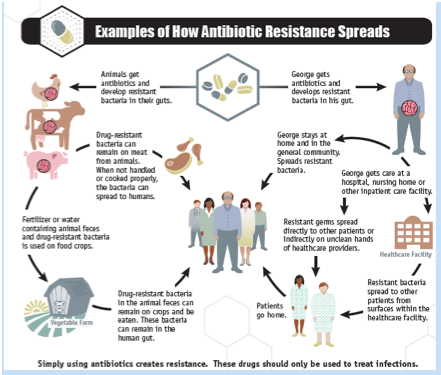 The emergence of antibiotic resistant bacteria marches on. The most recent iteration is a bacteria common to all humans, Klebsiella pneumoniae. This bacteria may now carry genetic information that allows it to be resistant to the vast majority of antibiotics, and the few antibiotics that remain active are seriously toxic to human kidneys. We are in a bind to safely treat this common bacteria that has emerged after years of antibiotic bombardment made it an impending threat. No antibiotics are currently in the pipeline to help us, and we will have cases in the future of this bacteria being completely untreatable. If you ever took only a few days worth of an antibiotic or begged your doctor to give you an antibiotic for a disease that isn’t treated with antibiotics, like the flu, then you need to walk the plank! I admit I am guilty. I wanted to get back to work earlier and asked for antibiotics when probably not needed. I was fortunate not to develop C difficile. C difficile causes unrelenting diarrhea and this bacteria is causing havoc in the US, especially in our hospitals. The other is carbapenem-resistant Enterobacteriaceae (CRE), commonly known as resistant Klebsiella or E coli, as Dr. Campbell discussed. Taking antibiotics and using proton pump inhibitors (drugs that reduce acid reflux) are some of the contributing factors that are making C difficile more common than Methicillin-resistant Staphylococcus aureus (MRSA), and now considered an urgent threat to public health in the US. We all need to do our part! Taking antibiotics only when appropriate, completing the prescribed dose and, if experiencing diarrhea after taking an antibiotic, alerting the prescribing doctor are three weapons we can use to beat back these potentially deadly bacteria. 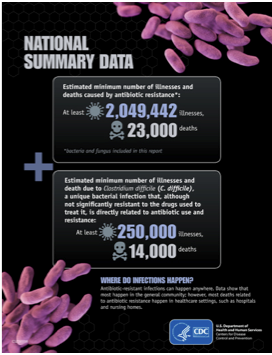 For more information on antibiotic resistant threats, click HERE and head to the CDC website.